Now in Large Print! 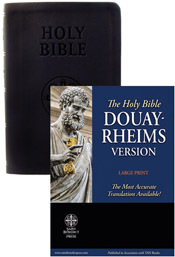 The most accurate English translation of the Latin Vulgate available today. Premium UltraSoft Black Cover. With embossed emblems, gilt edges, ribbon marker, full color maps and presentation pages.